DeskSoft ScrollNavigator helps you to scroll your documents horizontally and vertically. Simply click and hold down the right (or the middle) mouse button anywhere in a window and move the mouse to scroll the window contents. This saves you the trouble of positioning the mouse cursor over a scroll bar and it allows scrolling both directions at the same time. 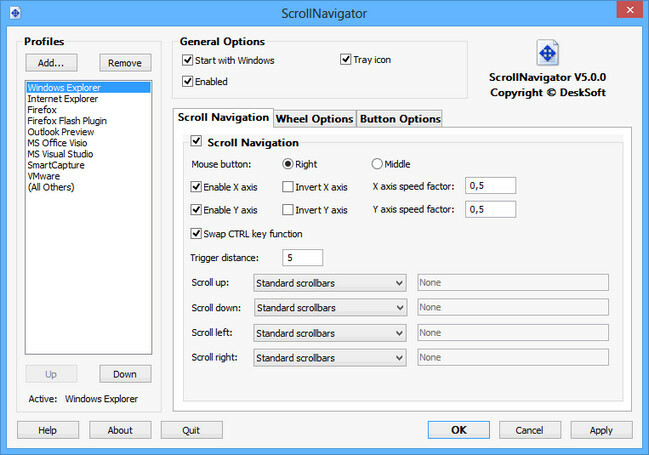 ScrollNavigator works with all windows that have standard scroll bars (e.g. all office programs, explorer windows and most other applications).